The crackdown on free speech continued this week under President Mohammed Morsi (left) with a conviction of Ahmed Douma for insulting the leader. It is only one of a variety of cases against Egyptian journalists, bloggers, and others charged criminally for their criticism of Morsi and the imposition of authoritarian measures and Islamic laws in the country. Some 2300 people are charged for their involvement in anti-government protests. The crackdown on free speech is being indirectly supported by over a billion dollars in U.S. aid to the government. I agree with John. Far too early. I will also add that this is the future of America at its present course. Will some Congressman or woman get the balls to file a Bill in Congress to cut off all aid to Egypt? Write your Congressman. We are supporting Adolph Hitler’s son in law. raff, We just print money to pay ourselves..no problem. Hebrews 12:29 for our “God is a consuming fire. 1 John 1:5:This then is the message which we have heard of him, and declare unto you, that God is light, and in him is no darkness at all. Condemn another see that light as hell being the utter and complete end of you. Repenting is the only thing that will save you. Condemn another see y that light as hell being the utter and complete end of you. Repenting is the only thing that will save you. Darren Smith of Washington State declares from his heart . But my daughter likes him, ’cause he’s a fellow USC Trojan. That may or may not impress anyone else. Which devil do we want to back? I have a novel idea. No foreign aid to any country that does not actively promote civil liberties. Of course, we may not be able to pay ourselves! The law of unintended consequences pertains to virtually every regulation imposed on people by politicians and military. The aftermath of a revolution is rarely tidy or pleasant (anyone recall the Alien and Sedition Act?) and two years on is too early to call the endeavor a failure. The fact that there continue to be activists willing to stand up to the new government shows that the situation is not yet lost. Also, just to show solidarity with Douma for insulting the president, I’d like to add that Mohammed Mursi is a stupid and ugly. Turkey is having the same phenomenon … but it started by a protest by people protecting trees. The gummit came down like Homeland Security on Occupy so the protests grew and morphed into a protest against a**holes (Occupy Turnkey). Like AY alluded to, it is so Homeland. While the idea of revolting against tyranny is very attractive, almost all revolutions suffer the fate of putting into power people who are equally as bad as those replaced. Abdul Nasser was an army colonel who replaced a an absolute monarch (King Farouk I) and became one himself. While Anwar Sadat, a Nasser crony succeeded peacefully and actually improved Egyptians lives, he was murdered because of his moderate policies. Hosni Mubarrak took over an gradually assumed more absolute/oppressive control. Hosni went and the Muslim Brotherhood who were the most organized faction in the revolution (that was aided by us) took power and Morsi is following in the grand Egyptian tradition of autocratic oligarchy, with unfortunately fundamentalist religious overtones. Assad in Syria is a pig, but beware of his replacements. The lesson for the U.S. is to stay out of other country’s business because of the law of unintended consequences. Springtime for Hitler in Germany! Autumn for Poland and France. Civilized nations and people need to stop thinking of these muslim pirate territories as anything but hellholes. East of Corfu the Ten Commandments do not apply. Western media needs to learn how to spell Morsi’s last name. 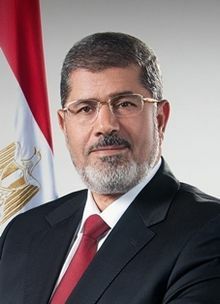 Is it Mursi or Morsi? Is it Mursi when he has his tenthead on? What happened to the “glorious Arab Spring”? Who was naive enough to think this isn’t what would happen? Did some people really think liberalism would blossom? And… Under the current right…..or is that reicht….. How are we much different…. Prosecuting whistleblowers…..
Should have just thrown a shoe @ him.